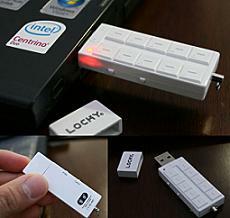 There’s something very James Bond about a USB flash drive with a 4-digit password and concealment capabilities. And that’s exactly what you’ll get with the Locky USB drive. Its design is rather basic, but still, it makes a change from the novelty based USB drives that appear to be swarming the peripheral market. But I’m guessing if you’re the kind of person with a need to keep information locked away, you’re probably no the type to opt for a cuddly/smelly/extravagant/plastic-y USB peripheral are you? It features a number pad on its outer shell to give you access to 1, 2, 4, 8 or 16GB of memory, which equally serves the purpose of bamboozlement should anyone attempt to break into it. Espionage equipment doesn’t come cheap but you can feel every bit the spy here, for $61 USD. Nice…but I don’t think it beats the Swiss Army Knife one I bought my wife. That comes with a nail file too! !